Cairo, is much like any of the modern cities with wide roads, malls and big departmental stores. 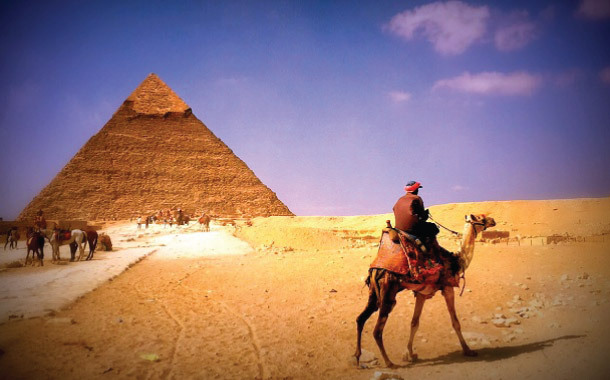 We chose to stay at Hotel Mercure Cairo Le Sphinx in Giza with rooms overlooking the Pyramids. Next day, we had to start early to cover the Pyramids of Giza, Sphinx, Museum of Cairo and the Nile cruise with dinner. Armed with sun-block, caps, scarves, and camera, we left the hotel promptly at 9:00 a.m. Within 5 minutes, we were at the entrance of the Pyramids arena. 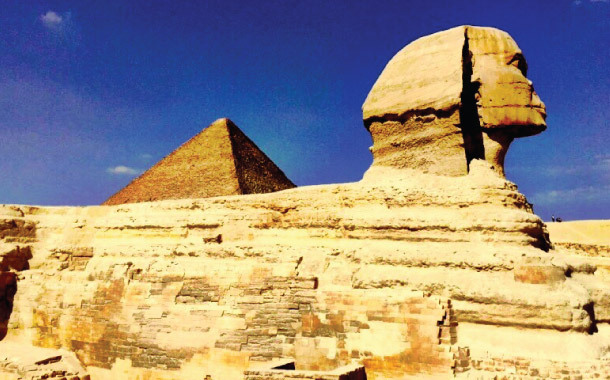 It is a massive compound that houses 6 pyramids and the Great Sphinx. 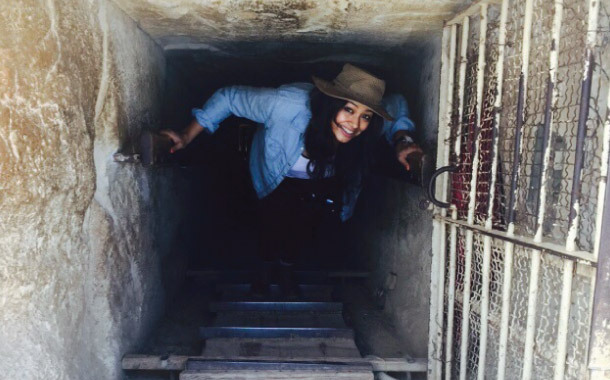 The entry ticket gives access to the compound and allows visit inside two pyramids. Word of advice: If you are claustrophobic, don’t enter them. The Great Pyramid’s entry is the most expensive and there is nothing to see inside, so save the money and don’t buy that ticket. In the Queen pyramid, one has to climb down 5 meter before arriving in a 5 x 5 room. To enter the Pyramid No. 2, one has to climb 10 meter steep down. The openings are extremely narrow and one has to be bend substantially. All the artefacts from inside these Pyramids is on display at the Museum of Cairo. (our next stop). These Pyramids are architectural marvel, blocks of stones piled-up and no binding material like the cement has been used. While gazing at them, battle scenes from the movie Transformer were playing in my head - how Decepticons and Autobots were tossing each other on these magnificent structures and destroying them! Since it’s a large area, we hired horses to make our life simpler. Slowly, treading our way from one Pyramid to the other and then to the Sphinx. Frankly, throughout the route I was scared of being thrown to the ground by the horse. I was praising the lord and kept a tight leash. The Great Sphinx of Giza is magnificent posed body of lion with a human face. It was a symbol of strength and benevolence. It got damaged in parts during the World War II and other natural catastrophes. It is placed such that it faces the Nile, but nowadays it overlooks a KFC outlet instead. 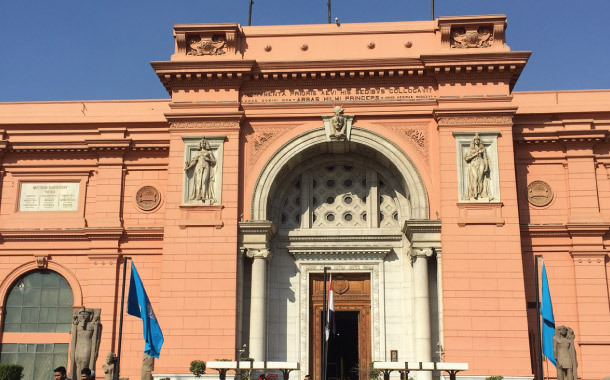 Our last stop was the Cairo Museum or the Egyptian Museum, where it all comes together. The museum is grand with millions of relics from tombs, tools, precious items, mummies, ornaments, clothes and a lot more from different dynasties and eras. We felt that even half a day was not enough but somehow we managed to cover each section. No photography is allowed inside the Cairo Museum. Tutankhamun’s displays are the most interesting. He ascended on the throne when he was 9 and died at 19. He was treated like God and on his death, all his worldly possessions, including his helper and slaves were buried to make his afterlife a better place. The evening was full of fun. We had kept the best for the last, ‘The Nile Dinner Cruise’. Cairo traffic is quite irritating during rush hours, much like Mumbai. 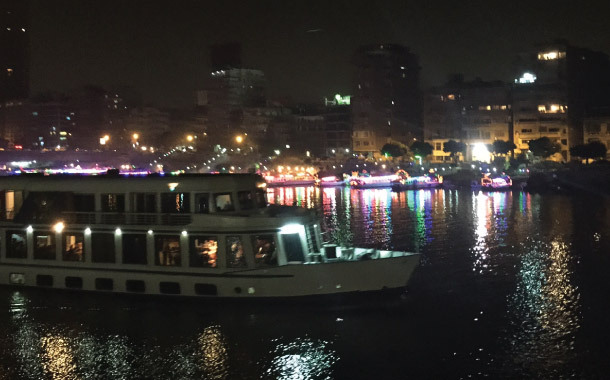 The cruise was scheduled to start at 8 pm, it was pitch dark and buildings on either side of the Nile were well illuminated. We were seated on the lower deck patiently waiting for the star attraction, the much talked about ‘belly dance’. The moment she walked in, it was show-time and the crowd went mad; her gyrating belly made a lot of hearts skip a beat, left mouths watering and it would be fair to say that it embarrassed the kids. There was pin-drop silence in the room, camera flashes going crazy, and all we heard besides the music were loud whistles and cheers in the room. It was 30 minutes of scintillating performance that was followed by folklore. Darawish, Sufi men perform Tanoura dance. It is similar to Sufi whirling, the costume is a long colourful skirt which is also used as a prop during the performance. Trust me when I say this, the artist performing Tanoura dance was a doppelgänger of Robert Downing Jr. For a second, we all thought it was him. The two hours on the cruise were extremely entertaining; towards the end we went on the upper deck to enjoy the cool breeze and city lights. On the last day, we visited the local bazaar to buy some souvenirs for family and friends back home. We had to haggle at every stage and how it made me feel that I was in India. Time really flies; we were on a roll-coaster from the moment we arrived. I gathered a lot and learnt from this experience. History needs to be preserved as it is the only link with the past. Egyptian are very much like we Indians, in driving, swearing, hospitality, warmth, respect for elders, etc., but they need to add curry to their food! Huge fans of Bollywood especially Amitabh Bachchan and Shah Rukh Khan. Lastly, in retrospect 11 nights / 12 days is the ideal duration to cover everything, but for how much duration you come here, it would not be enough for this beautiful country.